Jang, i can only say this to you : Well said man! US moccers are constantly criticed by the public, if they don't like it how WE have done it for US then why don't they do it their own way and stop complaining? I am and always was on your side, moccers like us are artists! You can't tell a painter how to paint his canvas! You can't tell a singer how to sing his song! Unless you're the boss you can't complain! People need to learn respect these days, and not only on Lego-related stuff, everywhere you go on the internet you will see an army of haters waiting for you and it makes everything, like being the talented moccer you are, so difficult! So Jang i wish you good luck in what's gonna happen, as we say : ''If it has to happen then it will.'' and i also wich you good luck with your moccing and everything and whatever will be your choice, remember that Infinity (me) will always be on your side! I agree with all that you said. I apologize if I have been a part of this... I know I've done this once or twice; I know I did this on Qiji and on Makk. I'm sorry. It was intended as constructive criticism, but in retrospect, it probably just seemed like nagging. On another note, you should never change your MOCing style, it is unique and creative; you should never have reason to do so, ever. When I saw the title of this post I was honestly scared. And, um...does this mean you're making a white/tan/brown/black hero? That would be awesome. Jang, i just have one question for you? Why must you be so right and awesome all the time? Haters gonna hate I guess. Your MOCs are amazing. Like you said, the great thing about buildable sets is you can make them whatever you want. Personally, I think assymetry makes it look cooler. Why limit yourself to one color either? Hero Factory sets can be whatever you want them to be. This is what I believe in, imagination is bound to no limits. If it did, what is there to imagine about? I don't think you need to change. A lot of people, me included, like your MoC's just the way they are. It annoys me how controlling some people think they need to be about other people's work. If they think they can do better, give them the lime light and tell them to make something. See if they can form a fanbase from just that. Off topic dude. Jang, if anyone says you should change anything you do, dont listen to them. If you change what YOU make, it isnt yours anymore. I have given criticism before, so i am not speaking like i am perfect. My point is, MOC means MY own creation, so anyone can make their mocs however they like. I totally agree with you! I make more Bionicle and Hero factory mocs than you could fit into Legoland, and NOTHING limits me. People who say 'meh, too plain' or 'wrong' are wrong and plain themselves. You make excellent creations with your excellent imagination. Just keep doing what you're doing and let the haters hate (because what else are they gonna do? :P ) and you'll be fine. Oh, also applause for your awesome comebacks. There's nothing wrong with some healthy constructive criticism, but many often take it too far. I think you are right Jang. absoluely none of me hero factory MOCs are symetrical (at least the actual heroes arent). In fact I take the majority of my inspiration from you. for example in an earlier post of yours about how to put Savage planet villain heads on hero heads that caused me to discover a new method that in my opinion is more stable than the one in the videos and two of my current favorite hero MOCs have waspix and raw-jaw helmets. by the way the eyes don't line up but the helmets look like helmets not half masks. You made a surge and breez 3.0, so where's evo? i like your mocs i dont complain i just make my own versions of your mocs somtimes and then end up making completely original ones mocs out of them our my inspiration and entertainment for 5-10 minutes a day! see some of my mocs im tnlego29 i make the edited videos! In what way are your MOCs ever plain, and I would like to see the complainers do better! Me: So you said Jang's MOCs had this wrong with them, but I notice that you have that in half of your MOCs. He deleted his comments I think. His name was John or something. anyone who thinks who need to change should try being dog poop. NOTHING is wrong with any of these. if people dont know that thats thier problum. mocs are mocs any way you slice it they're personal and can be any way you like. Jang if you wanted to make a character completely out of Bionicle and teknic parts than everyone should take your word and compliment it not criticize and if they do it should be constructive criticism so you can learn from your mistake. If people want to say your amazing mocs are wrong let them post there creation and see how bad they look! WTF, Jang just talked about ridicuous expectations, and now you are asking h im for Evo 3.0... UNCOOL! MOC IDEA!! SLAMER DRAGON! it grabs its prey, flys really high then takes a nosedive and slams its prey into the ground!!! Your very first Hero factory hero moc had absolubtly NO hero factory parts. I think your clever enough to make a hero with a hero core even before hero factory was realeased. bro go on hero factory recon they have savage planet stuff!! Anonymous 38th comment, that is completly off the subject! Jang most likley already knows that. actully, none of the helmets are symettricle if you look closely. if anyone of your ''critics'' can do HALF the stuff you can do, they would understand. but they can't, so i guess we should just ignore them. Jang, you know what I've noticed? These people practically WORSHIP you. You are awesome and all(I'm a big fan), but awesomeness has a limit. You have a lot of fans and you should be proud of yourself. Loved the speech by the way, and I loved reading all the errors and typos in the comments especially!! I almost died of laughing!!! Great! An MOCER I know thinks just the same way! Many of his creations use strange colors and asymmetric styles, and they still look great! All MOCers should use this philosophy; no everyone should. Colors and asymmetry make the universe unique. You do not need to change at all. In fact, you were the one that got me into MOCing! If your other fans don't like what you do or how you do it,they need to start letting people do things they're own way. When you said that a head can be used on a weapon you were 100% RIGHT! My brother made a hero sized villain with a head on his arm mounted cannon, it looked awesome! And that's pretty good for a 7 year old. Nicely said, JANG! 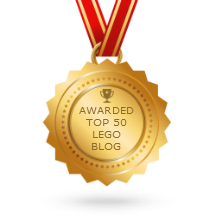 you really helped to define what the LEGO System is all about!